Ahead of National Tea Day on 21st April, our staff have revealed their secrets to making the perfect brew. A survey conducted this month amongst our employees found that tea trumps other hot drinks as the firm’s beverage of choice, with 57% preferring a cuppa to coffee. We certainly sink a lot of tea, with 33% estimating that they drink over five cups a day. When it comes to brands, 40% prefer their tea with a northern flavour in the form of Yorkshire Tea, 30% opt for PG Tips and an adventurous 30% go in for other assorted brands and flavours. 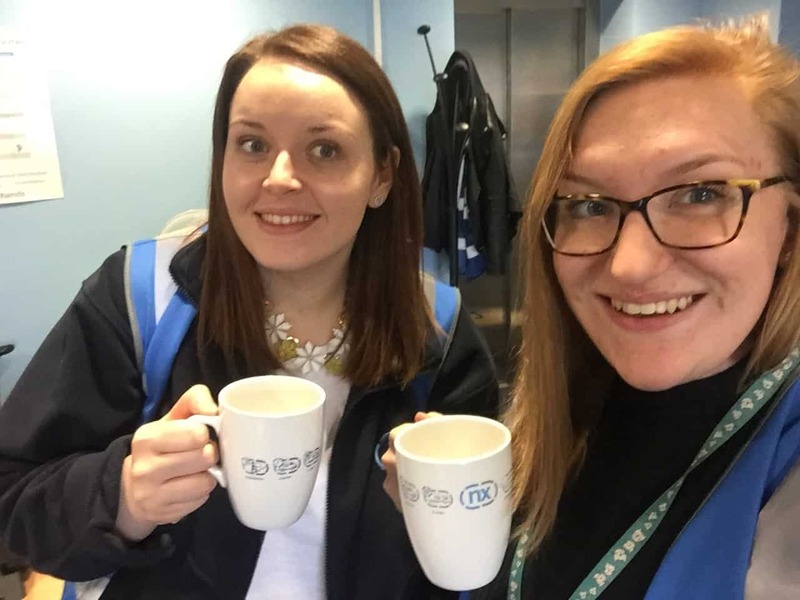 Team Leader & Account Manager Jo Lawlor and Marketing Manager Helen Chick enjoying their morning cuppa. In terms of the team’s favourite biscuit to dunk, Hobnobs narrowly pipped Rich Tea to the post. Milky tea was favoured by 42% of staff, while 33% enjoy a “builder’s brew” and 25% go for just a splash of milk. As for the most controversial question of all – whether to add milk first or last – a decisive 66% confirmed they put their milk in first. And, though tea wins out across the firm as a whole, “Rosie Lee” isn’t our warehouse’s cup of tea: staff here prefer coffee. Marketing Manager Helen Chick says: “As a typically tea-drinking nation, we wanted to put hot drinks to a vote and find out whether tea really is the most popular choice amongst our staff – and, if so, how they like their cuppas. For more information about us, you can also follow us on LinkedIn and on Twitter via @thenxgroup.